Providing the Stockton area with professional, fast and eco-friendly junk removal services. City officials and law enforcement officers take the issue of illegal dumping very serious here in Stockton. This is why you are encouraged to call the Stockton Police Department Neighborhood Services Section if you see any instance of illegal dumping. This doesn’t just mean someone tossing an old tire into a vacant lot but also anyone who leaves something like a couch on the curb. It’s not supposed to go there. Even if you don’t know who dropped off something like that you can still report the problem. Many folks who dump their trash like this think there isn’t a problem because “everybody else is doing it.” That’s why it is vital for you to break the cycle and report illegal dumping when you see it happening. There is a local company who is dedicated to stopping illegal dumping anyway they can. Junk King are the junk removal experts who make getting rid of bulky items like old couches and appliances extremely hassle free. This means there should be no excuse for dumping something in a back alley or by the side of the road, not when Junk King Stockton is just a phone call away. Junk King defines “hassle free” as taking away all the work from you. They’ll be sending over a dedicated crew who will perform all the lifting duties. Even if it might only take one strong mover to load up what you’re getting rid of, you’ll still have two crewmembers at the ready. Most Junk King calls involved at least one big item like an old sofa, a stove or something equally bulky. Those same crew members not only know how to lift but they’ll also have the right equipment. That holds true if they need to take something apart or load something in a bin. The hassle-free attitude also applies to the payment structure. Here you’ll be presented with an estimate that approximates the volume of space your junk will fill up on the Junk King truck. This is a flat fee that covers everything from the labor to dumping charges to truck rental and it’s very competitive. If for any reason all your junk ends up taking up more space you’re not going to be charged any extra. Once you agree on that fee it’s locked in! 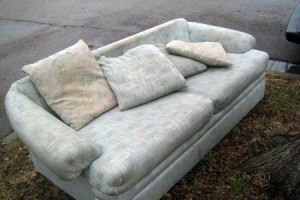 When you’re ready to toss out that old couch or any other eyesore around your home then give Junk King a call. They’ll set up an appointment right away and you can experience the simple joy of having all your junk taken away in a single trip! This entry was posted in Junk King Stockton, Stockton Furniture Disposal, Stockton Furniture donations and tagged Stockton Couch removal, Stockton Furniture Removal on November 1, 2013 by Carlos Duenas. Last updated August 2, 2017 .